A process as fundamental as nuclear migration can be expected to have common components in different organisms. In fungi, nuclei must migrate at specific times and in predetermined directions for growth of hypha to occur, for spores to be formed and for mating to take place. 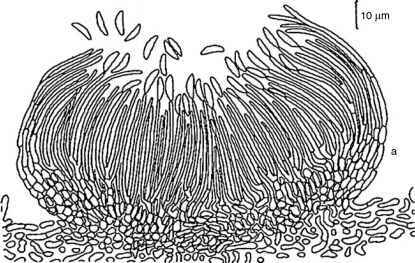 Nuclei divide in the hyphal tip (King and Alexander, 1969) and migrate through septal pores into hyphal compartments. The fungal hypha is therefore an excellent material for studying the rates and mechanisms of long distance nuclear movement. Light and electron micrographs show dumbbell-shaped nuclei squeezing through septa or becoming thread-like while entering into a branch. The fungal nuclei may therefore be quite variable in shape. A new technique to study the migration of nuclei is to stain it with DNA-binding fluorescent dyes or tag with the green fluorescent protein (GFP) and monitor movement by video-enhanced fluorescent microscopy. Velocities from 0.1 to 40 ^m/min have been observed (Suelmann et al., 1997). Microscopy of live cells often shows nuclei to be stationary in a moving cytoplasm, dispelling the notion that cytoplasmic streaming carries nuclei. The analysis of fungal mutants provided evidence that nuclear movement requires a motor to move the nucleus through the cytoplasm, a track for the nucleus to move on and a coupling mechanism to link the motor to nucleus (Morris et al., 1995). The nud (nuclear distribution) mutants of A. nidulans and the ro (ropy) mutants of N. crassa, respectively, have clustered nuclei rather than evenly distributed as in the wild type. The wild type nud and ro genes were isolated by transforming mutants at non-permissive temperature with plasmids containing wild DNA and isolating the rare cells that grew into colonies (functional complementation). Plasmid DNA isolated from transformed colonies carried the wild nud+ or ro+ gene. Sequencing of nud+ and ro+ genes revealed that they encode components of the multi-protein complex called dynein, a mechanochemical enzyme that provides the motive force for movement of nuclei along the filamentous tracks of actin and microfilaments in the cytoplasm (Osmani et al., 1990; Morris et al., 1995; Minke et al., 1999). Given the complexity of molecular motors, several genes are expected to be found that control nuclear migration and their positioning. directions in hyphal compartments to reach a branch initial, suggesting individual regulation of nuclear mobility (Suelmann et al., 1997). The observation suggested that branch initiation is independent of nuclear distribution although germ tube growth does not occur until a nucleus has entered into it.